Herdabout K-9 Academy is happy to announce our upcoming class schedules. Please be sure to have read and understand our Safety Rules before you sign up for a class. In order to make sure each student is working to their potential, class size is kept to a maximum of 6 students/dogs. Please scroll down to see our scheduled classes over the next few months. If you don't see the class that you want, let us know. If we have four or more people requesting the same class, we will make arrangements to get a class started. Most classes run for Six Consecutive Weeks (unless otherwise noted). Please note: If instructors are required to cancel a class for any reason, the class will be made up within a reasonable time period.If a client is unable to attend one or more weeks of class, those weeks will NOT be rescheduled or refunded. All classes must be paid for in full at the time of booking. E-Transfer is the ONLY method of payment accepted. Ask us for details. Cancellation of a booking in any class PRIOR to the start date will be subject to a $50.00 cancellation fee. Call us at 705-429-0833 to register for a class. If a class is marked as "FULL" please call to be put on our waiting list. Then we can contact you if there are any cancellations and/or new classes scheduled. 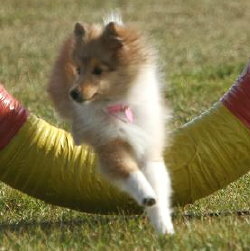 This class is for those who have a puppy or young dog and want to prepare for the conformation show ring. 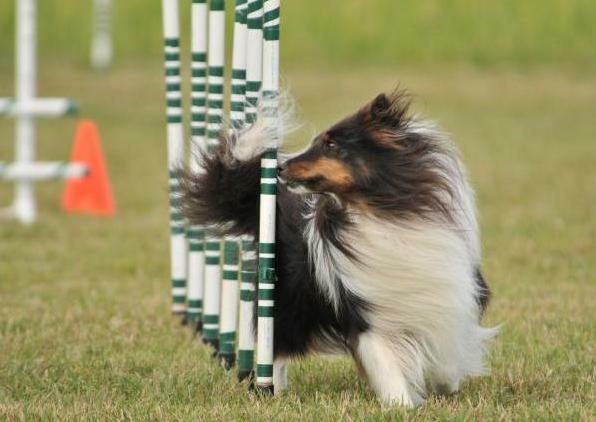 Special focus for new comers to the sport who need to learn how to handle a dog and work the patterns that a judge might require the handler to perform in the show ring. Gentle and positive methods will be used for getting the young dogs exposed to being examined by a judge. Classes may be scheduled soon. 6 weeks (six 50 minute lessons that build on each other) in length (this includes the one on one obedience training listed on the obedience page). For those who cannot fit into a group class, for whatever reason, or those who just prefer one on one training, we offer private lessons. These private lessons are flexible with day and time, booking around our group classes. Private lessons are designed specificly to your dog and your skills, working on whatever the dog/handler team needs to concentrate on in order to gain success within their training level. Payment is due in full at the first lesson of the series. Please be sure to read and fully agree to all the Safety Rules in order to enroll in anyHerdabout K-9 Academy class. All classes must be paid for in advance. Cash is the only method of payment accepted. Dogs must be onflat buckle, martingale, or slip collars made of fabric, leather, or chain for these classes. No head halters, body harnesses or flexi leads will be permitted in class for safety reasons. Please check the Safety Rules page for more Do's & Don'ts. The instructor reserves the right to refuse and excuse anyone from lessons at any time. Please call us at 705-429-0833 to register for a class. Pre-arrangements must be made to attend any classes. If a class is marked as "FULL" please call to be put on our waiting list. Then we can contact you if there are any cancellations and/or new classes scheduled.